As a family of five with three kids under the age of two we had a DESPERATE need for a practical triple stroller. 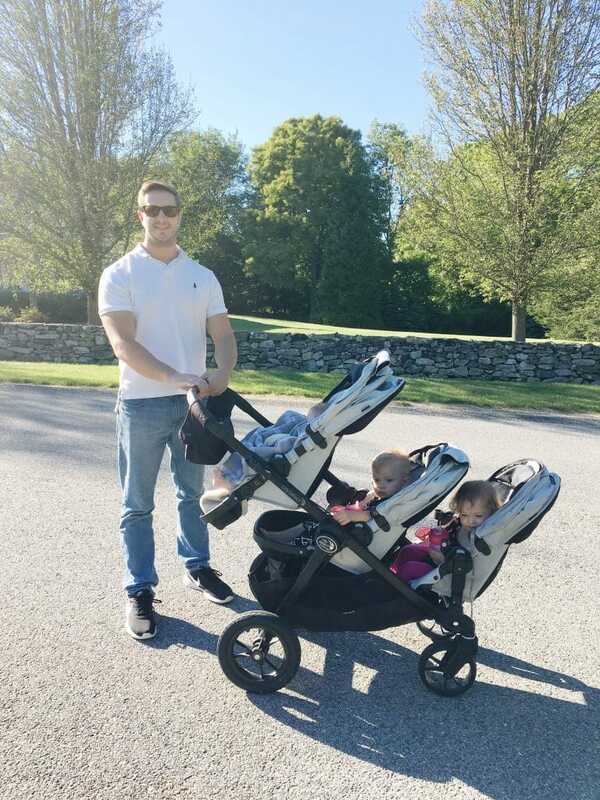 After baby Harrison came into the World when our twins were just 20 months old, I found myself researching every single triple stroller on the market, which only left me with a handful of options (six to be exact)! I ruled out just about all of our triple stroller options due to various inconveniences. 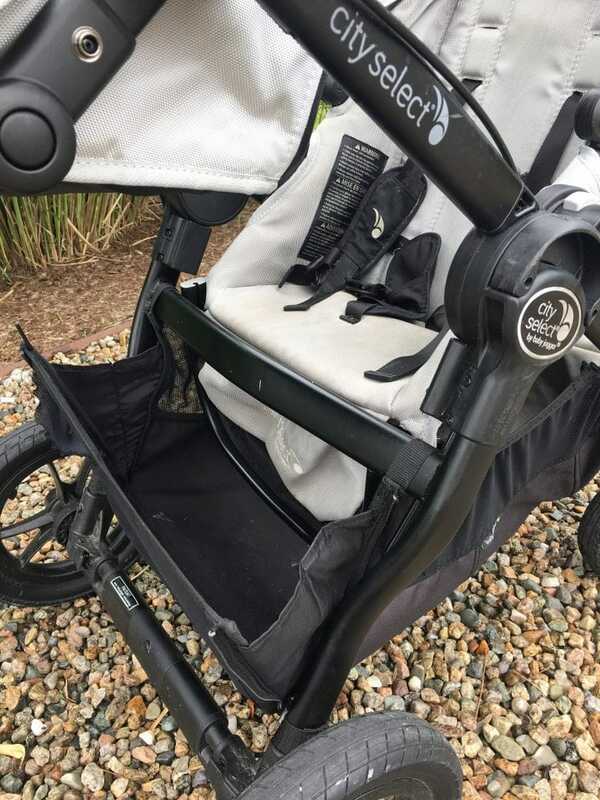 We already owned the City Select Double stroller, which I loved and didn’t want to part with…but I didn’t think it would work unless we continued using it along with a second single stroller. Then, after exhausting all of our options we came up with an amazing triple stroller solution that I still can’t believe! Valco Tri Mode with Joey Seat (approx. $600 to $800)– Impractical for child in joey seat, difficult to fold and transport. We already attract attention with three kids under two, and strolling around with one child propped up in the air is just made me feel very awkward and uncomfortable! Foundations Quad Stroller (approx. $500-$900)– I spent a lot of time considering this option as it seemed like a comfortable option for the kids…the only problem was that it wouldn’t be comfortable for us to transport. The Foundations Quad weighs a whopping 84 lbs. and will not fit in many cars and small SUV’s. We could have fit it in our Volvo XC90, but it wouldn’t have left us with much space for anything else. 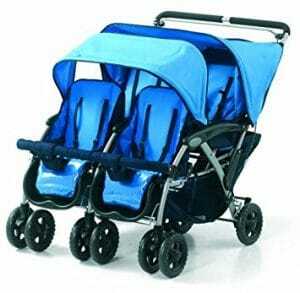 Joovy Big Caboose Tandem Triple Stroller (approx. $450)- We actually purchased this and returned it. It has two permanent seats and a third option for sitting or standing in the back. We would have purchased the additional seat insert for the back to make the back seat more comfortable and practical. It was simple to fold and lightweight at just 33 lbs., but bulky extremely bulky and practically impossible to transport. At over 5 ft. long, we actually could not fit it in the large trunk of our SUV. We probably could have found a way to squeeze it in, but it would have had to rest on top of our children’s seat, which was not a possibility. BeBe Love Triple Jogging Stroller (approx. $700)– Literally one of the only options if you want a jogging stroller. 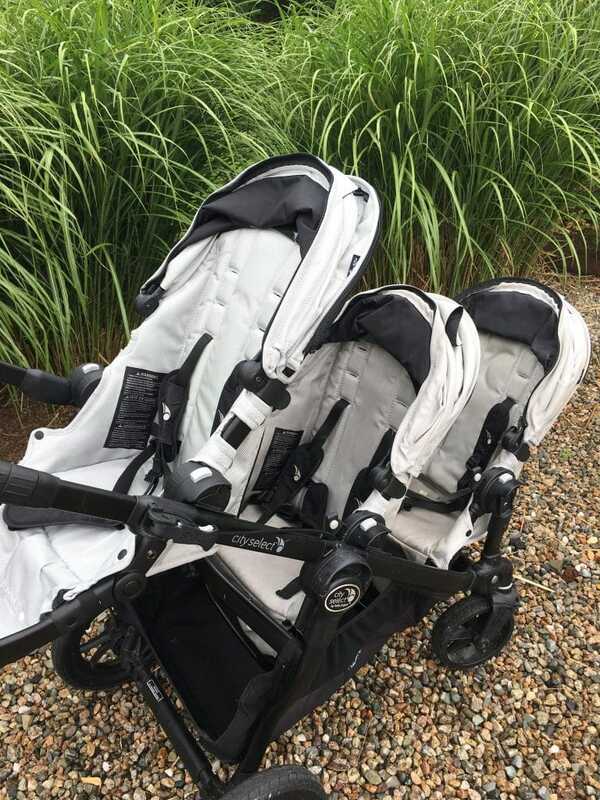 This triple stroller does not get very good reviews, its labeled as “bulky”, “cheaply made”, “impractical”, and their customer service doesn’t have a good reputation…so this just didn’t seem like a good product to spend 700 dollars on. 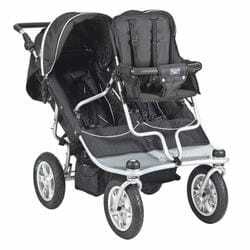 Foundations Triple Stroller (approx. $400)- I wasn’t crazy about the length and look of this stroller. It felt like another attention magnet, and at just over 60 lbs. I knew I would not be capable of transporting it alone. Its reviews indicate that its very heavy to push, and not suitable for long walks or frequent use. 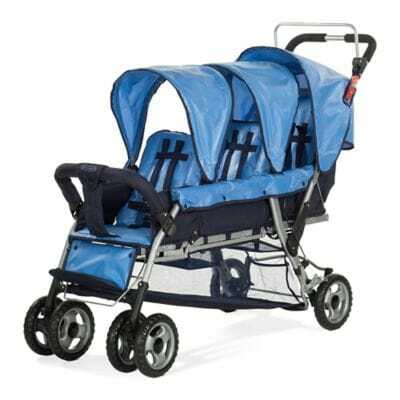 Childwheels Triplet Pram (approx. 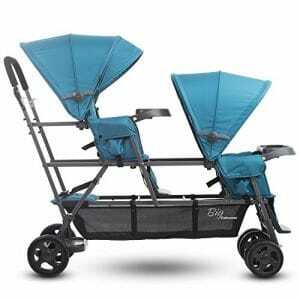 $900 with International shipping) – I wanted to purchase this triple stroller, it simply made the most sense to me. It seemed compact, yet spacious for three children, and simple to maneuver. The only issue with this triple stroller is that it is a bit heavy at 60 lbs. and it is difficult to purchase as it’s only available in Europe and would need to be shipped Internationally, otherwise, it seems like a beautiful triple stroller option. Then, an incredible thing happened, after scrolling through Instagram one day, I came across some photos from a few brilliant parents around the World. 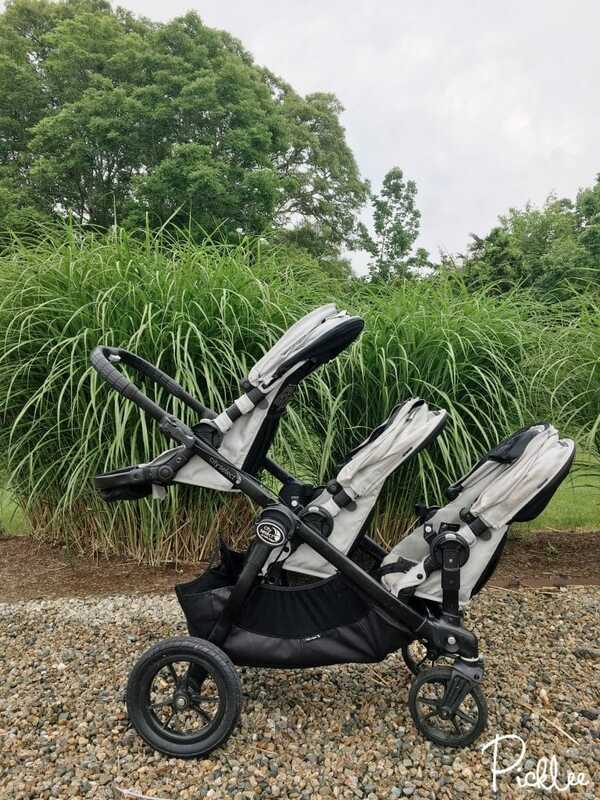 They had figured out how to add a third seat to their City Select stroller, making it the most visually appealing and practical triple stroller EVER. My mind was beyond blown (insert prayer hands!). Since we already owned the City Select Double Stroller, all we needed to do was purchase one more seat for it ($180)! We purchased the seat and got to work modifying it right away. It was super quick and simple to do. My favorite part about this triple stroller option is that its extremely compact (the same length and width as a single stroller!!) and the seats are completely removable so if I wanted to go out with one of two of the kids I could just remove the seats! The only slight downside to this triple stroller is that its VERY compact, the seats can recline a bit and the kids have enough, but not a ton of room. 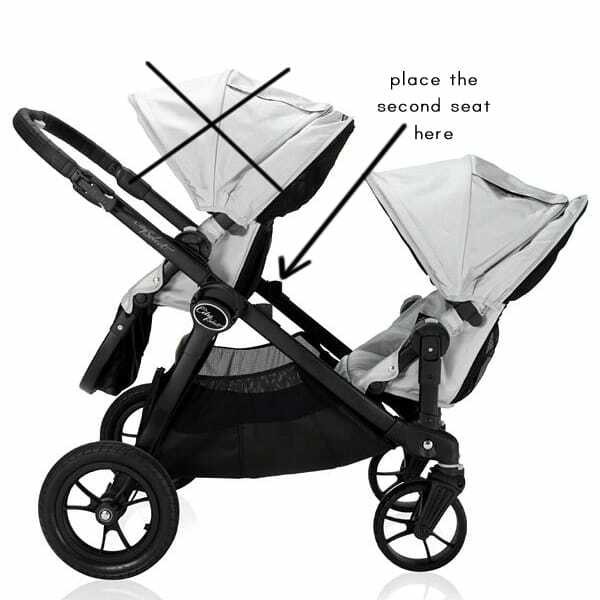 First, you have to purchase the stroller itself along with two additional seats. When you buy the additional seat(s), they come with the extra bracket you will need. If you already have two, just buy one seat and you’ll be all set! Recommendation: You can use the screws that come with the brackets, however once you drill the holes they may not be super tight. This was the case with one of our brackets, it was a bit loose. We would recommend going to Home Depot or hardware store to find screws with bolts. This way you can drill all the way through and then just tighten the bolt on the other side. This will leave you with everything you need to modify the stroller. Basically, the third seat will stay on the bottom using the supplied risers, just like it would be if you were using the stroller as a double. Then the second seat will be placed on the next level up, in the same spot that you’d use if you were using the stroller as a single. For the third seat, you’ll need to drill a set of holes. Detach the brackets from the highest spot, then place them higher up in the new desired location. We attached ours right below the brake brackets. First, mark out the holes where the brackets will sit, then use a drill to predrill the holes. NOTE: If you would like extra security, which we recommend, drill all the way through and find a screw and bolt from a hardware store, so they are sure to be secured fully. Find one that is just long enough, so there isn’t a sharp screw sticking out. We did have one screw that was a little loose, so this is why we would recommend this. Now, simply reattach the seat brackets in their new position and click in the third seat! One additional modification I made was to remove the footrest on the middle seat. This enabled it to sit up slightly straighter. It takes about a minute to remove the footrest by simply pushing in the buttons on the sides and pulling it out. That’s all there is to it! 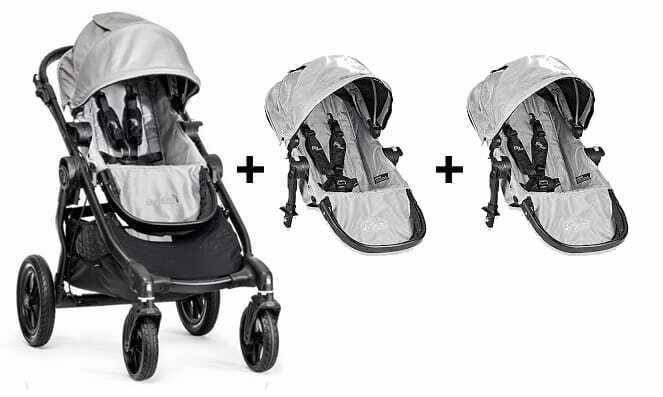 Here’s our City Select Triple Stroller in action! We love taking it on neighborhood walks! We’d love to hear from other families who’ve tried this and/or have questions about giving it a go! This is amazing!! Do you know if it makes a difference if I buy the single with 2 additional seats or the double with one additional seat? Thanks!! Good question! It does not make a difference, as long as you don’t buy the single model with the permanent seat. 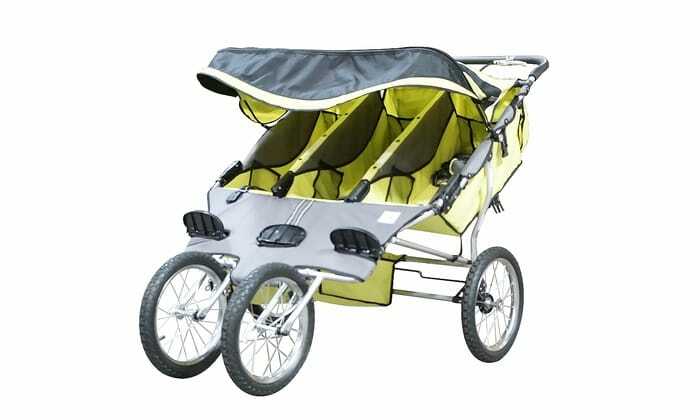 Just be sure that whether it’s the single or the double, its the Baby Jogger “City Select”. Best of luck to you! Genius!! Is it possible to use all three seats flipped the other way? Thanks! Have you tried combination with 3 car seat? I just expect triples very soon. Congrats on the triplets!! One thought is use it as a double and wear the third baby on you until they can all sit in the seats without the car seat. I am currently doing that. 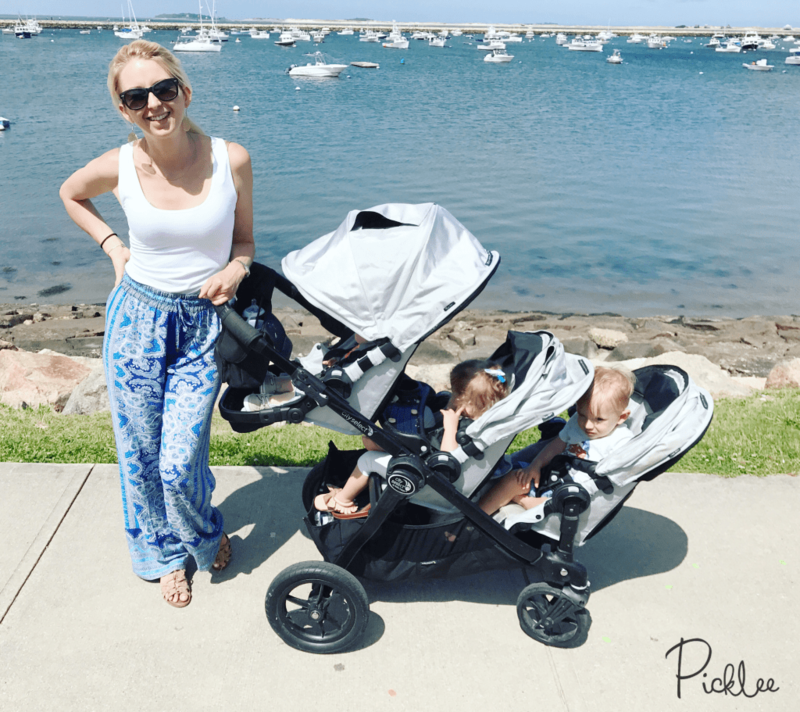 I have 21 mo twins and used this stroller from the beginning and love it. Just had another last month and am wearing him for now until we can make this mod. Congrats on the new baby! That’s exactly what we did at first too! Do you know if the 2014 will work? Also is the bottom seat rather tight in space? This is exactly what I have been looking for!! The new 2017s are out and they are supposed to be lighter. I will make sure the seats are removable but do you know if this would work with the 2017’s? Thanks again for this amazing article! It should work with it as I believe it’s even slightly taller! Let me know how you make out though! I’d love to hear! Did this work with the 2017? I want to do this for my triplets as well. Thanks so much for sharing! I know you responded to someone else that you didn’t think 3 car seats would fit. Do you think 1 or 2 car seats would work? Did you use a car seat in the stroller after your 3rd was born? Thanks! That’s a great question! I’ve been wondering the same. I don’t think two carseats will fit with the 3rd child seat, but one may. I will test it shortly and let you know! TESTED and IT WORKS! We tried the stroller today with a car seat on the highest tier and and fit without a problem! I don’t think two car seats would work, however. Wishing you the best! What brand car seat was it? Just wondering bc of the adapters are different for different brands. We have the Chico key fit 30. Hi — curious about the car seat that will fit? We also have chicco keyfit 30 and would like to do this. Does it need an adapter to fit, or will we need to buy a city select car seat? Thanks! We aren’t sure how that would work. We had a car seat adapter for our Graco SnugRide but we had to take out the third seat and just have two. Hi Stephanie, sorry for the late reply! Yes, we had it extended all the way out or it’s too short to accommodate all three. This is just what I have been looking for! I will have 3 under 18 months and definitely need an easy way to get around. I am trying to understand what model years this would work for though as I would like to buy used if possible. I know yours was a 2015. Any idea on older models? Should I spring for the 2017 because it’s a little lighter and longer perhaps? Also to confirm when I put this in my truck I have to take off each seat or no? You will have to take the seats off to fold it, even as a double… I haven’t tested this with any other older models so I can’t be much help in that department…I can only assume that it should work just the same! Hi! Thank you so much for sharing this brilliant idea! I’m a bit confused, lol. Where exactly did you drill the holes in and where did you place the third seat? I have twins and a three year old. I already have the citi select so I would like to try this!! The holes were drilled at the top of the frame, just below the break to create the third level! This will free up space for the middle seat to sit in the lower position , then the third seat sits at the base of the frame where it normally would. Confused.. As well where the holes are for the childs seat at the top by the handle. This would be so conviant due to i am expecting my third in 5 months. I already have the city select double love it absolutely. But where i drill the seat at top is where i am unsure about. And do i move the middle one where it would be actualy a single seat? Or the bottom two are left alone and the top is just moved up for more space for the moddle seat? Ijust want to be sure where i drill the holes its where they need to be. One more question can they recline the two bottom ones a little or not? Also the middle seat is it able to have its foot rest come up a little for the childs feet? Hi, please re-read the instructions. You have to drill holes and move the top brackets higher. Have just bought the double and am struggling to get a second hand extra seat… but I will win! Have positioned the bottom two seats so far and I can’t seem to get the seat to fit with the bar across like yours does. It will be a life saver when I figure it out! What size drill bit did you use to drill? We didn’t take it down. We recommend holding the bit up to the screw. Start with a lower size, then if it’s too tight, use a larger one. So I love that I came upon this! I have searched for a couple years to a solution to this! I have a nb, 2 & 3 year old! I also have a standing board but for now I want to use my car seat and 2 seats! Going to drill holes today! Praying all goes smoothly! Question; WHAT SIZE DRILL BIT DID YOU USE? ALSO, DRILLING IS ALL THAT’S NEEDED? THAT WILL MAKE IT SO THE SCREWS HOLD? Thanks!!! You don’t need to notify to use 2 seats and a carseat, they fit just fine as is!! 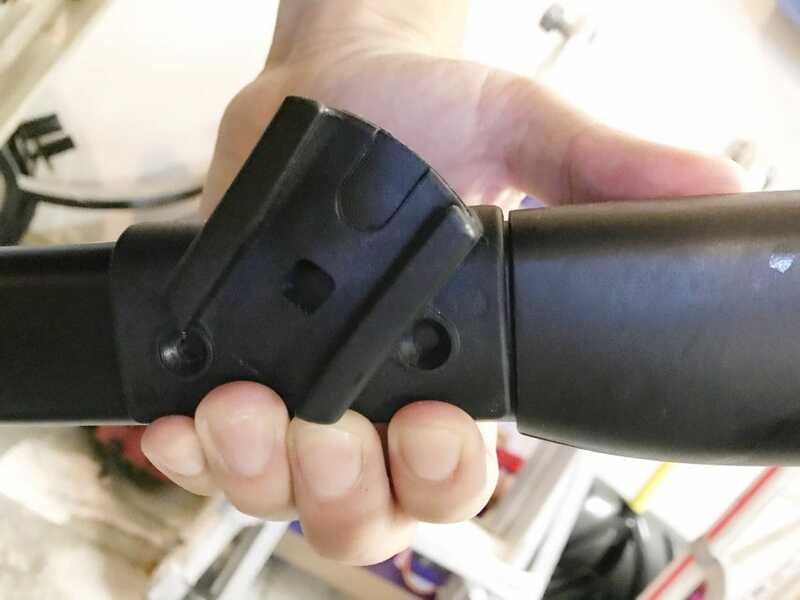 The car seat adapter lifts it high, so higher brackets may not work. I have 2 seats, a carseat and a glider board on minewirhout modifying the brackets or frame. Wish I could post a picture to share. I have 3 month old triplets- two boys and a girl. I bought this stroller. Can you tell me if you can lay down the sit? Like if they are sleeping? Yes, they can recline to enough for sleeping but not completely flat. I love this modification! Unfortunately, for me I’m having twins and will have a 20 month old and a 3 year old. So I’ll need a stroller that can hold 2 car seats with the 3rd seat. The best one I found was the Joovy one, but I was also concerned about how big and possibly bulky it would be. Maybe when my twins are old enough to sit alone in the seats, this will work better for me. *sigh* I’ll continue my search, hopefully I’ll find something! Thank you for giving me hope outside of using traditional strollers. A few people have said that they’ve tried it with two car seats and a third seat it works! Hi, great idea, thanks for posting. My first question: you said you’ve used yours from the beginning. then, even if not completely flat, the recline would still be comfortable enough for newborns? i’d rather avoid using car seats, if possible ( will have 2 newborn twins and a 20mo old). Second question: do you think the heavier kid, the 20month old needs to sit in the bottom two seats? would she be too heavy (relative to the lighter newbors) to sit on the top seat ? They will recline a bit, but not completely flat. I believe the stroller seats are rated for 6 months + though? You may be able to buy a newborn insert? I usually put my biggest kid in the bottom back seat just to bc it makes me feel better, but I’m not sure it makes a huge difference? we are going for it! Awesome! And congrats on your triplets! Would love to see a photo when it’s all set up! With the three seats in, have you been able to use any rain covers? I would like to avoid buying 3 of the individual ones from baby jogger. Be a good fix for that. Hello, does anyone know what size drill but needs to be used? Thanks! My three girls ariverd just 12 days ago and I don’t have a stroller yet😣 Do you know if I can lay down three of them at the same time? We’re getting ready for our triplets. Can you tell me how this held up over time? And as your kids got bigger did the stroller still maneuver well? Thanks! Can the older kids get out easily? Or do you need to help them with the seats so close and facing back. The middle can sometimes be tricky. We had our daughter, the smaller of the two toddlers, sit in the middle. They learn how to sneak their legs through after a few times! Do you know if this will work with a city mini or the summit? Do you think you can do a youtube tutorial on how to do this?? Probably too late for you, but we may make one soon! 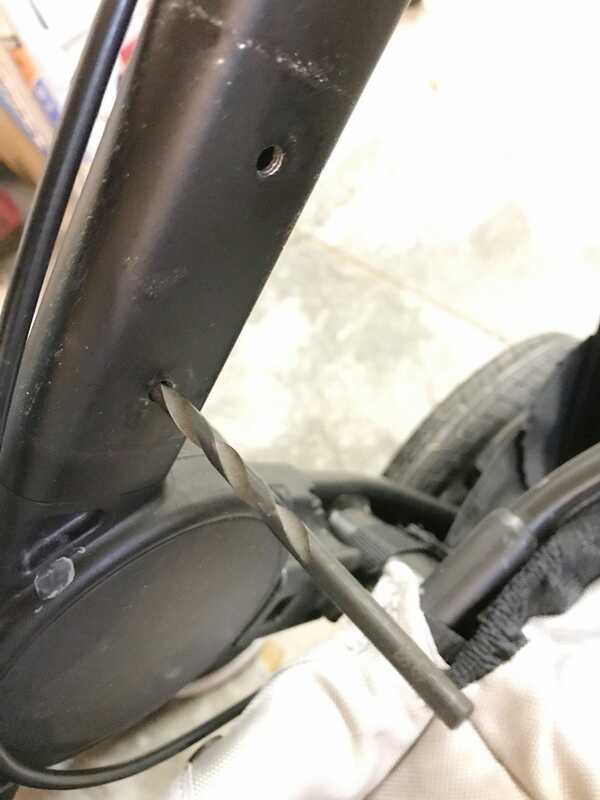 Are you still able to extend and retract the push handle after this mod is done to the stroller? No, unless you reverse it (after your LO gets big), then it’s free to move again. Is there a way to show which stroller to buy on Amazon to make sure I get the right stroller and extra seat combination? Hi Vanessa, we linked to all of the products in our post, please take another look. Would you be able to say which size drill you used ? Also did you drill all the way through or just on the inside of the frame ? Did you use another tool to make the lines for the screws to fit in? Would love to know. I don’t have 3 children but I want to raise the seat so it’s easier to recline with the children sitting back to back ! We recommend holding the bit up to the screw. Start with a lower size, then if it’s too tight, use a larger one. 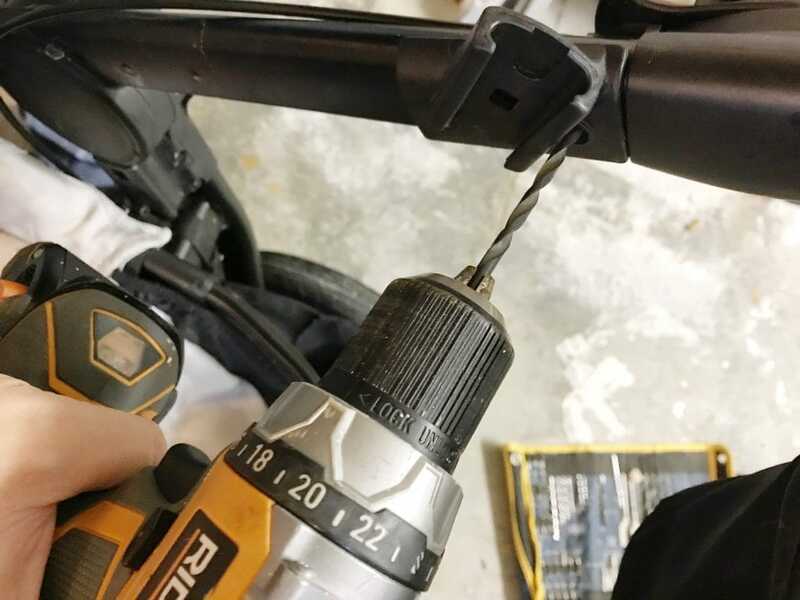 We didn’t take down the size, however one user in our comments said her husband used a 3/16″ drill bit. Expecting triplets and love the 3 toddler seat option. 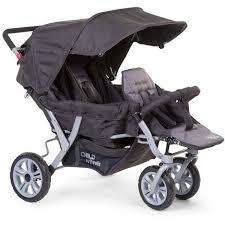 However what stoller do you recommend for carseats? We are trying this now and my husband wanted me to note that the drill bit size for the holes is 3/16th. Curious to see if this will work – we are hoping to try with two car seats (we use adaptors for the graco click and connect). We have twins on the way, a 15 month old AND a 3 year old. It’s going to be working overtime for sure! This is amazing!! I am pregnant with baby #3 and I have a 2 and 3 yo. So I need something to have them all contained. Would this work with a infant car seat attached?? Just double checking. You said people have used it with two car seats and one seat correct? Having twins and my oldest turns two shortly. Also what size drill? Thanks so much I am so excited! Thanks for posting this ! I am moving my second seat up so we don’t have the argument of seat kicking. Not planning on having a third but at least the seat will be moved if we do. I am having a hard time drilling the holes, was there a certain drill bit you used? Hi Adrienne. We used a drill bit made for metal I believe. You can check at your local hardware store. Hi Ana! Glad you like the post! Yes, you can definitely still do this. Please read our updated instructions. We recommend adding a bolt with a nut for extra security. Hi do you still use the stroller, I have 3 under 2 and thinking of this but not sure it will be a great idea with the seats being so tight. Any advice is appreciated. Do you find yourself needing multiple strollers or does this suffice? Hi Mayra! We stopped using it when he got heavier. I forget the exact weight looking back on it, but you can tell when it’s time by the amount of effort it takes to push and turn! If I think of the age/weight I will post it back here. We just had our third, all under 3… I was dreading having my near 3 yr old ride that board thing. My husband found this post today and immediately went out and added the third position. All works great with two toddler seats and a car seat!! Cool! Have you thought of removing the basket so the kids had more foot room? I’d be worried about it tipping with too much weight on the top seat. Is there an extra adapter that comes with the city select that doesn’t come with the Lux? I think there is only one option for the original seat and then the bottom for the 2nd seat. Wow! How did you think to come up with such a genius idea? Capri, do you have a picture of this please, how did you do it, and which model pram do you have 2015/16/17 ? Mayb I asked where did you find the bracket for 3 rd seat? Hi Annie, the brackets come with the extra seats. You move the top one further up. We updated the tutorial, please take a peak if you are still looking for instruction! Can you turn the new third seat front or does it always have to be rear facing? Wonder if I could put the bassinet up at the top and put a single seat forward facing down below in front. I’d like to add a 3rd seat but I’d rather it be a car seat, do I need to buy the regular seat to get the brackets & buy the car seat adapters? Or do I just purchase the car seat adapters? Have you had any experience with the stroller being top-heavy or tipping if the child in the bottom seat gets out to walk? We have a toddler and twins on the way and it seems like our toddler would work best in the bottom seat, but we want the option of letting her get out without putting the other two at risk if I let go of the handlebar. We didn’t have any tipping issues, but you can tell when it is top heavy. I would probably leave at least one in the front. Don’t hang anything from the back bar, maybe put a bag or something in the bottom to help. Hi I have twins that are 20 months old and a baby thats 9 months. We currently use two strollers a double and a single. If I want to go out with all 3 kids I have to take someone with me or carry the baby in a carrier. I considered a triple stroller but they were all soo big and heavy that I thought two strollers was the better option. But now that I saw your post I am wondering if this will work for us. First I am wondering do you feel this one stroller suffices or do you have multiple strollers, since this doesn’t seem like the most comfortable option for the kids. Also can you name any downside to this stroller? Such a great idea you are a life saver. We love this stroller and wanted to not have to buy another one if possible. We will have 22 month old twins when our third is born. We were originally planning to get the boogie board for one of the twins at the base for when the newborn doesn’t want to be in a carrier anymore but I was thinking a young 2 year old may not be ready to handle something like that so this is a great option. We use and love the snack trays with our current double configuration. Do you know if the snack trays would fit in the triple? I notice you don’t have them in the picture. Thank you! Hi can you please tell me how this is working out for you in the long run ? I have 20 month old twins, and a 9 month old baby. I tried to put the twins in this stroller but they hate the seats cause they can’t see, will this go away in the future ? Do you find yourself needing a separate strollers or does this one suffice ? Please any advise would be appreciated. I now carry two strollers and it’s just so bulky and not very practical, so this seems like a good solution but not sure my twins will adapt. Can you please advise how this stroller is working out in the long run? I 3 under 2 and think this is a great idea but not sure the kids will like it since the seating is a bit tight. Also do you have just the one stroller or multiples? Any advice is appreciated. Can this hack be done with the city select Lux double stroller? Do you know how this can be done to the city select lux? Hi Kaitlyn, we haven’t tried it on this one, so we couldn’t recommend it.